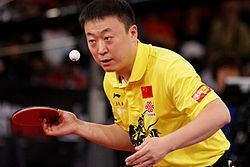 Ma Lin (simplified Chinese: 马琳; traditional Chinese: 馬琳; pinyin: Mǎ Lín; born February 19, 1980 in Shenyang, Liaoning, China) is a retired Chinese table tennis player. He learned to play table tennis at the age of five and became a member of the provincial team in 1990. In 1994, he joined the Chinese national team. Ma Lin is the only male player ever to win Olympic gold in Singles, Doubles and Team. Additionally, he holds a professional era record of 5 major titles (4 World Cups and 1 Olympic Gold), having won more World Cups than any other male table tennis player in history. 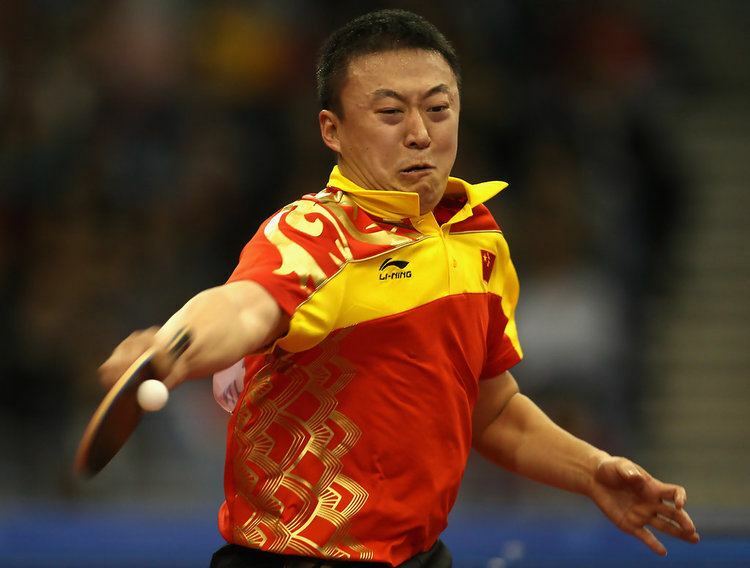 Since retiring in December 2013, Ma Lin has been serving as the head coach of the Guangdong provincial table tennis team. Ma Lin uses the penhold grip. An aggressive player, he is known for his converse unpredictable serves, heavy short push receives, fast footwork, and powerful third ball attacks. In addition to possessing a solid backhand block, Ma Lin also uses the reverse penhold backhand (RPB), an innovative stroke utilizing the underside of the blade which allows a penholder to produce topspin from both wings. The most dangerous weapon Ma Lin has in his arsenal, however, is his consistent forehand loop, which he often uses to end a point decisively. He is also considered as a master at serving and his serve is considered one of the best in the world, earning the nickname "Ghost Service". It involves the ball bouncing back to the net instead of going straight out of the table. 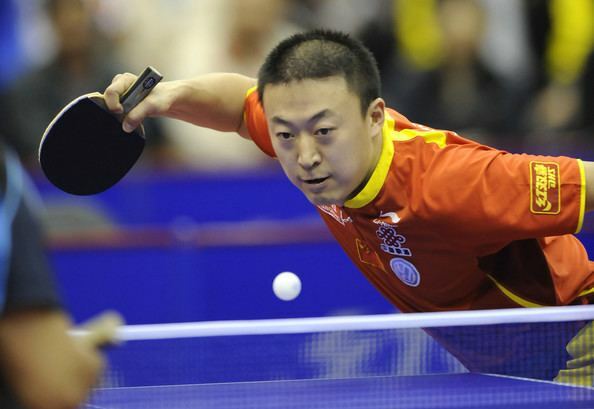 Because of this, Ma Lin has claimed the titles "Maestro Ma Lin," "Defense Killer," and "Table Tennis Olympic Champion." Ma Lin is currently using a Yasaka Ma Lin Extra Offensive Penhold as his blade. He uses DHS NEO Skyline 2 TG2 for his forehand and Butterfly Bryce Speed FX for his backhand. In the China Table Tennis Super League, Ma Lin played for Bayi Gongshang, Shandong Luneng, Guangdong Gotone, Shaanxi Yinhe and Ningbo Haitan. His transfer to Shaanxi Yinhe for over 5 million Chinese yuan was a league record but financial bust. His next transfer was to Ningbo Haitan for just 1.3 million yuan (US$168,000), including 1 million yuan in salary. In China, Ma is famous for his dedication to training ("拼命三郎"); in his early days, he was known for wearing down the soles of his shoes in just three hours. He has won the four World Cup trophies (2000, 2003, 2004, 2006), more than any other player in history, but has lost three times in the World Championship finals (1999, 2005, 2007). Ma has been criticized often for his lack of mental resolve, crumbling in crucial moments. Despite his victories in 1999, he performed poorly in the national trials and was denied a berth in the 2000 Sydney Olympics. He was seeded first in World Championship at Zagreb (2007); however, he lost in the final to his compatriot Wang Liqin, after leading 3–1 in games, and being 7–1 up in the fifth. At a post-match press conference, he revealed that his maternal grandfather had committed suicide before the tournament began. In the 2008 Beijing Olympics, Ma Lin won the teams competition with his compatriots Wang Liqin and Wang Hao. In the men's singles, Ma Lin defeated Korean player Oh Sang Eun in the quarterfinals (4–0), his rival Wang Liqin in the semifinals (4–2), and world number 1 Wang Hao in the finals (4–1). Ma Lin is now 15–10 head-to-head against Wang Hao. An anomaly to Ma Lin is that, he is one of the few Chinese players who isn't able to complete a grand slam because he has no World Championships title (his closest being 2007). 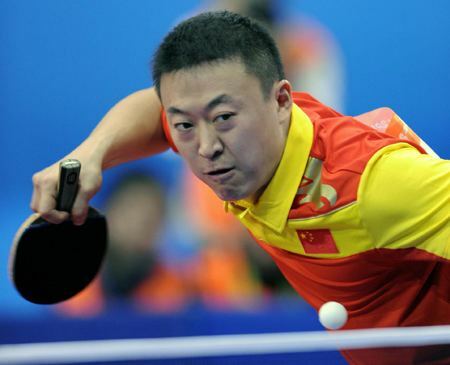 Yet, Ma Lin is considered to be the true Olympiad of table tennis because he has grabbed all possible titles in the Olympics (Athens 2004 – Doubles Champion with Chen Qi, Beijing 2008 – Singles Champion, Team Events Champion). Ma Lin has an 88.7% winning rate against all his opponents. Ma Lin's alleged girlfriend, Bai Yang, was dropped from Women's National Team in 2004. It is against the rules to date in Chinese National Team for athletes under twenty years old. Ma Lin went on to secretly marry actress Zhang Yi in late 2004. They divorced in 2009. 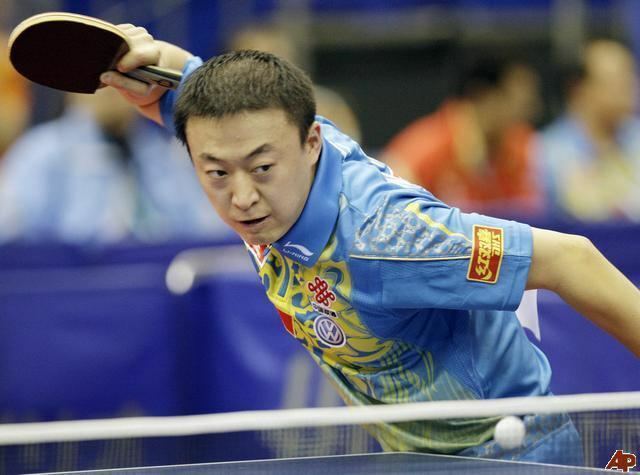 On this Ma Lin stated, "Table tennis would be my wife forever. This will never change." Ma Lin married Zhang Yaqing in December 2013. On April 19, 2016, they had a son. 2008 Beijing Olympic Games Men's Singles champion and Men's Team champion. 2010 Men's Team World Championship, gold medal.